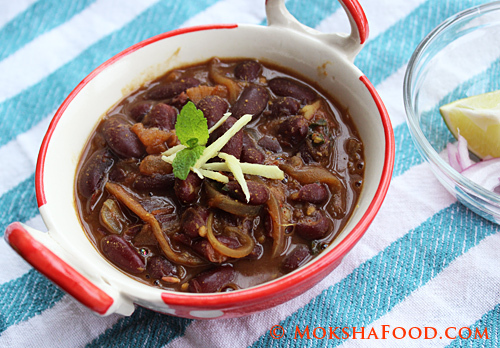 Rajma/ Kidney beans curry is a popular Punjabi recipe, usually made at home rather than served at restaurants . Its a hearty rustic meal when paired with white rice. I like the sauce to be the chunky so i don't puree the onion tomato curry base. Today i tried adding some mint leaves for extra flavor. These beans are little heavy to digest. The ginger aids in the digestion process so don't skimp on it. I like to add the julienne ginger for texture but my daughter doesn't like getting it in her mouth. So i grated half of it and julienne the other half. Use as per your preference. I always have dried kidney beans on hand. With a little planning, i wash and soak them in water overnight and then pressure cook till done. If you are in hurry, soaking them in hot water for 2 hours also softens them enough to cook. You can use canned beans for convenience. Add in the sliced onions and saute till slightly browned. Stir in the garlic and ginger and saute for few more minutes. Now add the mint and tomatoes and cook till they pulp. Add all the dry spices- turmeric pdr, red chili pdr, cumin and coriander pdr. 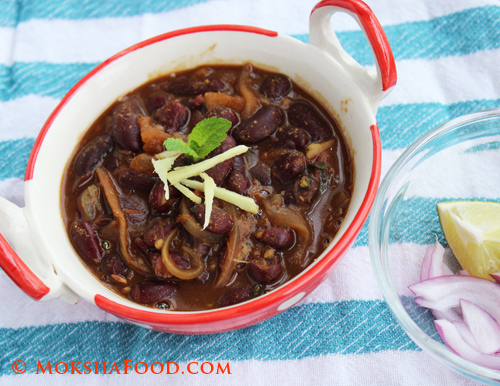 Stir in the kidney beans only and let it coat in the masala well. Pour the remaining water/ or add enough water to form a gravy. Let the curry simmer on low heat for 10 -15 mins to absorb all the flavors. The longer the curry sits, the more flavor it develops. Serve hot on a bed of white basmati rice with a a cup of yogurt, lime wedge and thinly sliced red onions.